Have you already heard about amazing savings available at U.S. OshKosh B'gosh during these days? Spend $20 or more and receive 15% discount on your purchase. Or, spend $40 or more and receive 20% discount on your purchase. 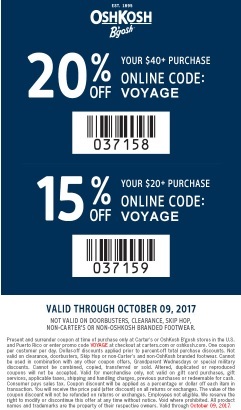 In-store use the printable coupon, online use the promotion code: VOYAGE. Get U.S. OshKosh B'gosh printable coupon now. For more details about the offer visit any U.S. U.S. OshKosh B'gosh store location or U.S. OshKosh B'gosh online.